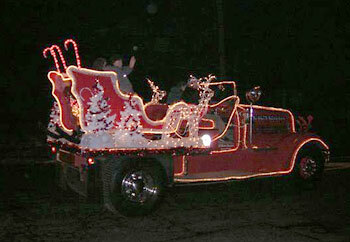 of events such as the annual Truck Parade during the Christmas season. 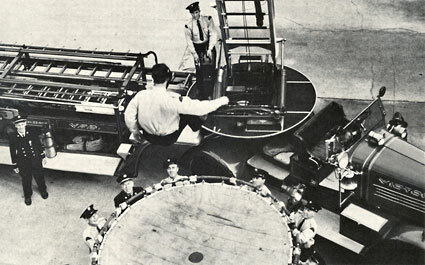 The 19 August 1938 issue of the Victoria Daily Times announced the arrival of a brand new Bickle Seagrave Aerial. It was an important event for Victoria, the Fire Department, and for the Woodstock, Ontario Bickle Seagrave Company. The new apparatus was one of the first purchased in Canada to be equipped with the new 85 foot all meta, hydraulically-raised ladder mounted on the trailer. So important was this occasion to the Company, that It’s head, Robert Bickle, traveled to Victoria in order to make certain that all was as it should be with the new rig. The tractor was powered by the standard Seagrave 12- cylinder 240 hp engine. At what at the time must have seemed the staggering price of $22,000 the new apparatus was desperately needed. The 1911 Seagrave the new aerial replaced was among the last pieces of horse drawn apparatus acquired by the VFD, and like all horse drawn apparatus was motorized with the replacement of its original draft gear by a Seagrave tractor. Long before the 1938 arrival of the new truck, the 1911 aerial was considered unsafe and all but “unuseable”. The 1938 aerial provided excellent service and had its engine replaced once before it was withdrawn from service in the late 1960s. A new 1965 LaFrance had taken over the role of Aerial One. A new 1971 commercial pattern International took over `tractor’ duties for the 1938 aerial trailer, until that too was disposed of, and sadly, later scrapped. 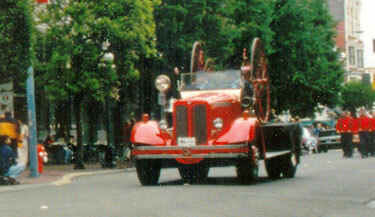 transports the VFDHS 1880s hose reel in the Firebells and Fanfare Parade in 1999. For the best immigration lawyer Toronto expert, you can call the law office of Ronen Kurzfeld for the best immigration law advice.